We actually did things besides eating while in Hawaii. I swear, we really did! Since I love all things history, one of the places we visited was Queen Emma’s Summer Palace. Even back in the day, downtown Honolulu could get hot and humid. Queen Emma and her husband, King Kamehameha IV, would head for their home in the Nu‘uanu Valley above Honolulu, were it was less humid, cooler, and a nice breeze was blowing. I can confirm that even though it was hot and humid in Honolulu, down by the water, there was a lovely breeze and it was much nicer at the summer palace. 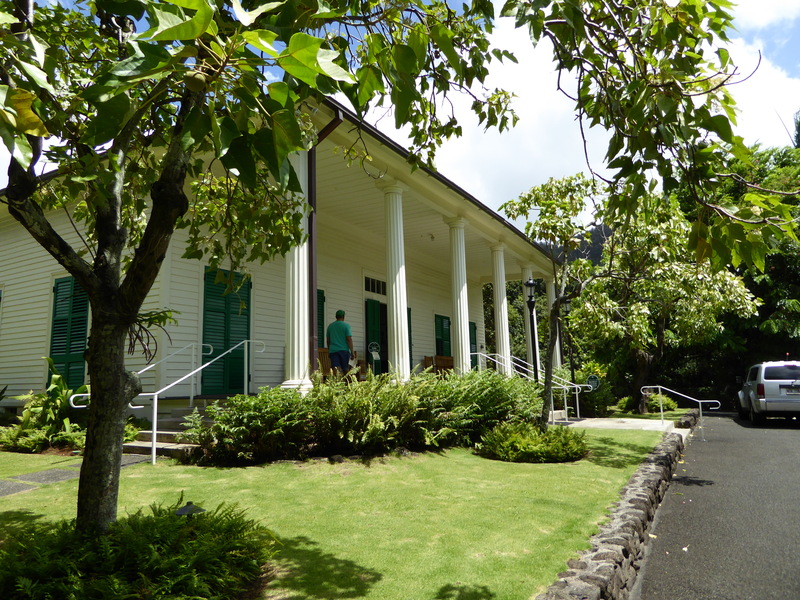 Queen Emma inherited the home from her uncle, John Young II, son of the famous adviser to Kamehameha I, John Young I. Below are photos of the front of the house. The frame of the home was built in Boston in 1848, and was shipped to Hawaii via Cape Horn. 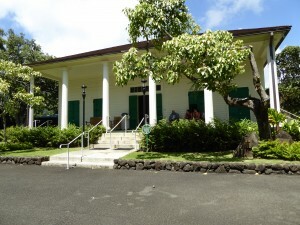 It was then assembled on property purchased by John Lewis from the Hawaiian government. It was one story and had six rooms. On the front is a porch with Doric columns in the Greek Revival style.After she inherited the house, Queen Emma later added a large room on the rear, called the Edinburgh room. It was added in preparation for a visit by Queen Victoria’s son, Alfred, the Duke of Edinburgh. The Summer Palace was Queen Emma’s retreat from 1857 to 1885. 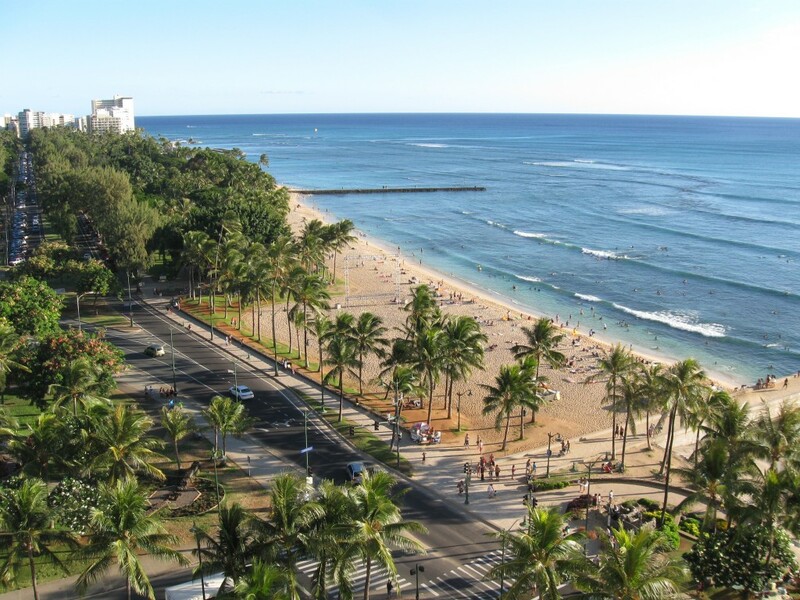 It is about a 10 minute drive from downtown Honolulu. The house was still filled with original furnishings and there were cases with family artifacts. If you want to get a sense of the history of Hawaii, you definitely have to visit Queen Emma’s Summer Palace! It started the first evening with a pie….and just kept going….as the four of us ate our way through Oahu! When our Hawaii uncles came to our hotel room the evening we arrived, they came with a pie. Ted’s chocolate haupia pie to be exact. Haupia is like a coconut flan. The pie was delightful! 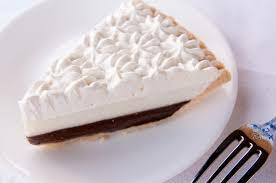 A layer of chocolate cream, then the coconut layer, then the whipped cream. It took us all week to finish it, but, don’t worry, we managed! It was delicious! Photo courtesy of Ted’s Bakery. 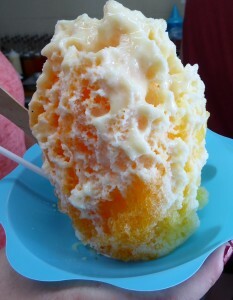 We were promised the best shave ice on the island and the uncles really delivered. We were just riding along with the uncles (or so we thought) and suddenly we pulled up to a little hole in the wall place. They called themselves a market, but the only thing they sold (besides a few snacks) was shave ice. 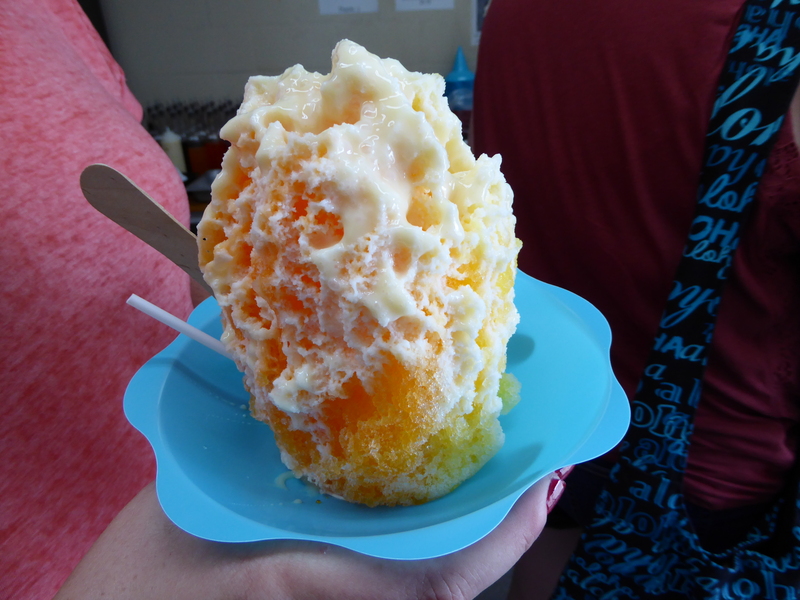 Big, beautiful, shave ice. 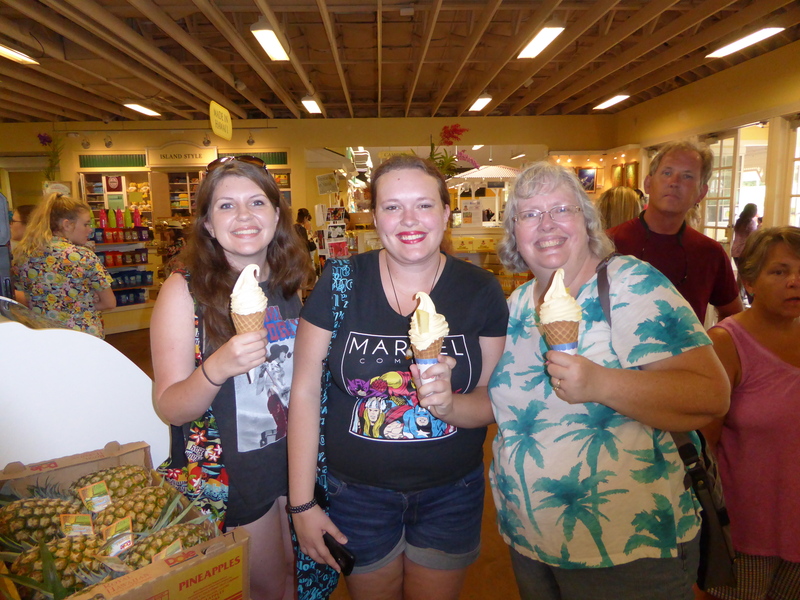 I skipped the ice cream on the bottom, and went for island flavors – passion fruit, guava, and coconut. Of course I got the condensed milk on top. The heat and humidity just disappeared while I was eating that baby! Then there was the Mexican restaurant. That is where we went for Uncle Bill’s 79th birthday. 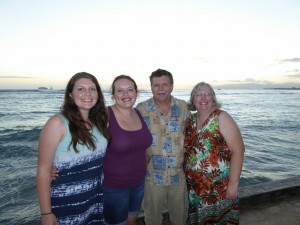 All four of us mainlanders saw the kalua pork tacos on the menu and were all in. Talk about food fusion! They were delicious! They were delightful! I must make kalua pork and stuff it in tacos with lettuce and pico de gallo and sour cream and pineapple and have them again and again! Sorry, no photo of the tacos. We were too busy eating to worry about photos! 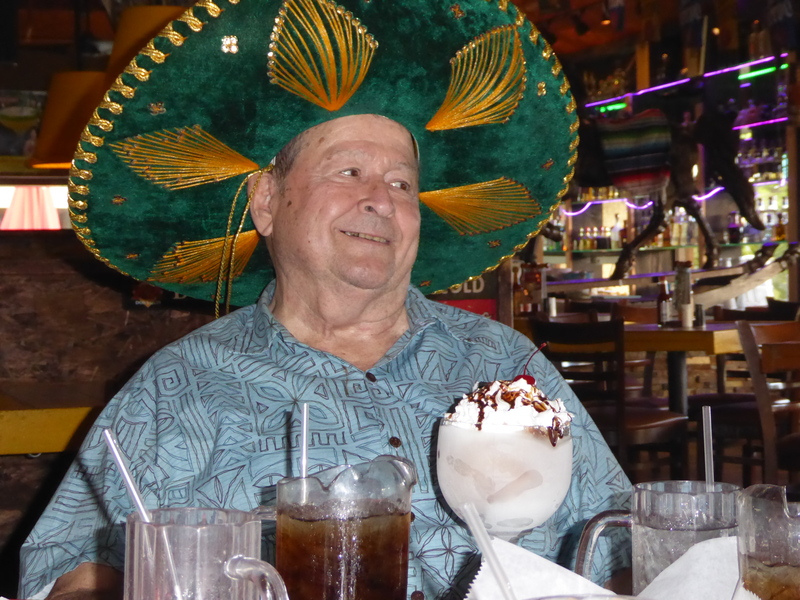 But here is Uncle Bill, wearing the birthday sombrero and getting really to enjoy his birthday fried ice cream. Oh, I forgot – we all got to share that as well! One of our eating goals was met when we stopped by the Liliha Bakery and got coco puffs. 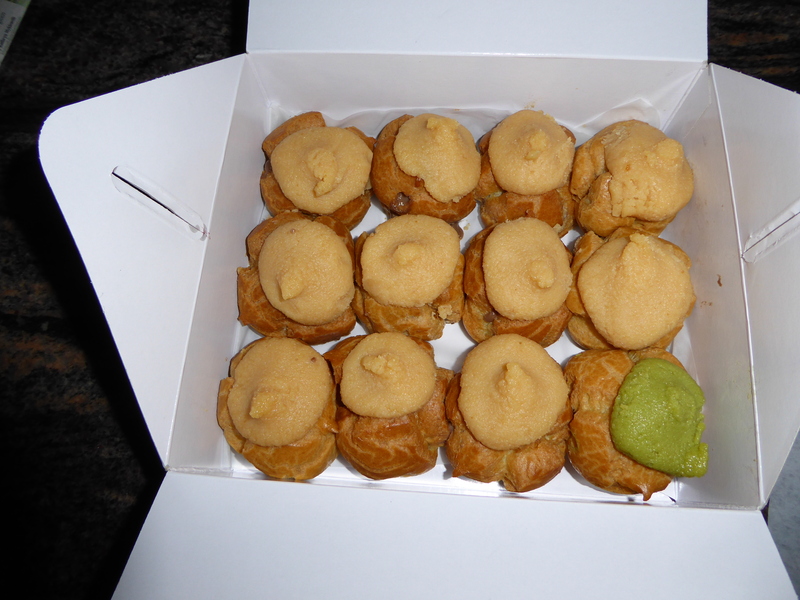 A cream puff filled with chocolate cream and topped with brown sugar icing. Wow! Yum! Lets get a dozen! Oh, that’s right, we did! Actually, we got 11 coco puffs and one green tea puff. Youngest Daughter has a thing for green tea. That is why you see that one green thing in the box. We also stopped bythe Dole Plantation. 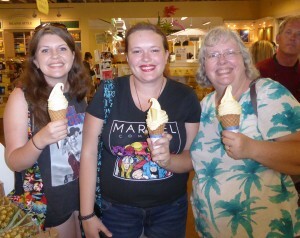 Our one and only reason was to get some Dole whip. That stuff is delightful! Then there was the Italian restaurant. The food was yummy, but it was the tiramisu that put the meal over the top. By then we had already eaten our way through half the island, so we just got one piece for the four of us. We all agreed, we could have each eaten a whole piece by ourselves. But, given all the pie and coco puffs back in our fridge, it was just as well we didn’t. 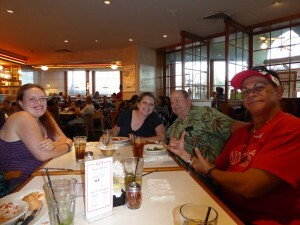 Here is Eldest, Youngest, Uncle Bill and Uncle Maka at the restaurant. 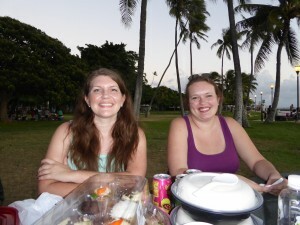 Finally, on our last night, there was the picnic by the beach. We had to take two cars because the uncle’s minivan was filled to the brim with food and drink. Nothing makes dinner taste better than a sea breeze and the sight and sound of crashing surf! There was fried chicken, some delicious noodle dish, macaroni salad, green salad, cupcakes, and, just because we loved them so, another round of those steamed pork buns I told you about before. We made barely a dent in all the food and the uncles are probably still eating leftovers! Youngest and Eldest with the table piled high with food. Us at sunset, the ocean behind us, on our last night in Hawaii.